Paying for Organic Growth or Sales? Are you paying enough? For? Is your business ready for Digital Marketing? Are you an app developer? Then App Store Optimization (ASO) is something you cannot afford to ignore. ASO is a process to make your app easily searchable and visible in different app stores. In other words, it’s effective to give your app a little upper hand over other similar ones. Why ASO is so important? According to a Forrester study, 63% people find the right apps from app stores while 34% get it from app store top charts. So, your chances are higher if you focus on app store optimization along with other possible methods. We, at TechShu, not only optimize your app for various app stores, but also make sure that it gets marketed properly on all the possible channels. To get a quote for your app or to know about its marketing possibilities, fill in the no-obligation form below. Our experts will get in touch with you within 1 business day. If you are an app maker, you are already aware of the issues. Both the App Store and Google Play have more than one million apps. So, it would be really difficult for you if you are here with a new app. According to the President of Appmosphere Inc., Nathan Ooley, the average life span of an app is around 14 months, provided you have something pathbreaking to offer like WhatsApp, Angry Bird or SnapChat. Taking cue from Ooley, the second big problem for app developers, is app retention. According to a study, 90% of all app downloads are gone in less than 6 months. App makers as well as marketers find it really hard to keep users use and engage within the app. This is an important factor to boost your app ranking in the concerned app store. Apart from that, engaged users always bring good referrals and reviews, which also play a significant role in app store optimization. App industry started with a very light mode. The main aim was to entertain people, so that they seek relief within an app, whenever they are stressed. But now with the ever-changing digital world, the industry has turned into ‘utility’ plus ‘entertainment’. Utility is the value, an app offers to an user for a long time. The longer it goes, the higher it grows. Games are clearly the winner, because they offer entertainment plus value in the long run. Even if app makers face retention and marketing problems, there is no denial that it’s the fastest growing industry in the online marketing scenario with more than 50 billion apps downloaded every year. It’s predicted that the total number of global app users will reach 4 billion by the end of 2017. So, there is surely a bright future for you, provided you do everything right to optimize your app. We are a digital marketing agency and we know it very well that mobile is the future of online. ASO is equally important for us, as many of our clients are app developers. We not only optimize their apps for app stores, but also market them so that they don’t face any retention issues. On App optimization: We optimize your app title, description, keywords, categories etc. To secure higher ranking for your app. 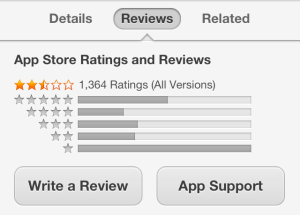 On App Signals: We improve your app’s ratings, reviews, ratings so that people are more encouraged to download it. Off App signals (Usage): This includes downtimes, crashes, uninstalls, current usages, active users etc. Off App signals (Social): Signals from different apps. Our marketing mantra is, integrating web, social and mobile. Web based marketing places: The tools are search engine optimization, directories, e-commerce market places like eBay, Amazon etc. Social market: Different social media sites like Facebook, Twitter, YouTube etc. Mobile market place: Over 70 app stores including iTunes, Google Play, Amazon mobile store, Samsung store. Because without a proper analysis, you cannot create a roadmap to success. There are 2 metrics, we use to analyze your project. 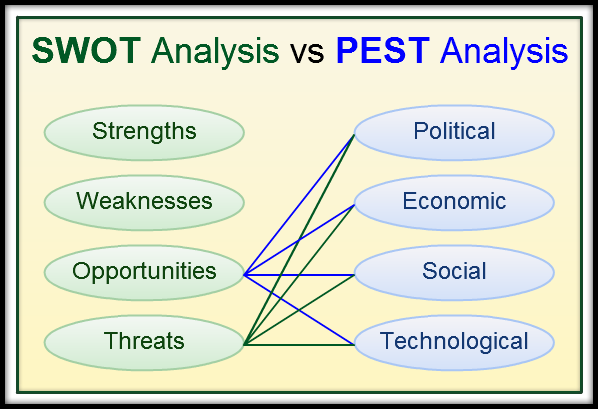 SWOT analysis and PEST analysis. SWOT metrics is all about analyzing your app’s strengths, weaknesses, opportunities and threats. We minutely monitor your app’s USPs and weaknesses over similar apps, so that we could market it in an optimum way. After SWOT analysis, there is PEST (Political, Economic, Social and Technological) metrics, which is directly related to the opportunities and threats of SWOT. PEST is important when you are planning to market your app in an unknown geo-location or country. We guide your internal Mobile Application Development Team with strategic marketing plan and user conversion optimization. We help you rank in top of all categories. We help you create innovative social media campaigns as well as PPC campaigns to take your app to the next level. There are more than 70 market places for your app. Our Team will help you in managing reviews and ratings of all possible marketplaces. We help in suggesting new business ideas for the betterment of your app. Five pillars of ASO: Our way to do it! Integrating the right Meta Tags is important to drive maximum app downloads. The biggest challenge for any app is, keeping the users engaged within the app. We utilize different types of signals heavily to rank an app on any app store. Reviews and ratings play a major role in app visibility. Encouraging users to give feedback in the form of ratings, reviews and comments is one of the best practices for ASO. But there is no room for fake reviews and ratings. App stores will identify them in no time and this could add a negative point to your app. We discovered that ‘install ads’ work really great to encourage more and more app downloads. 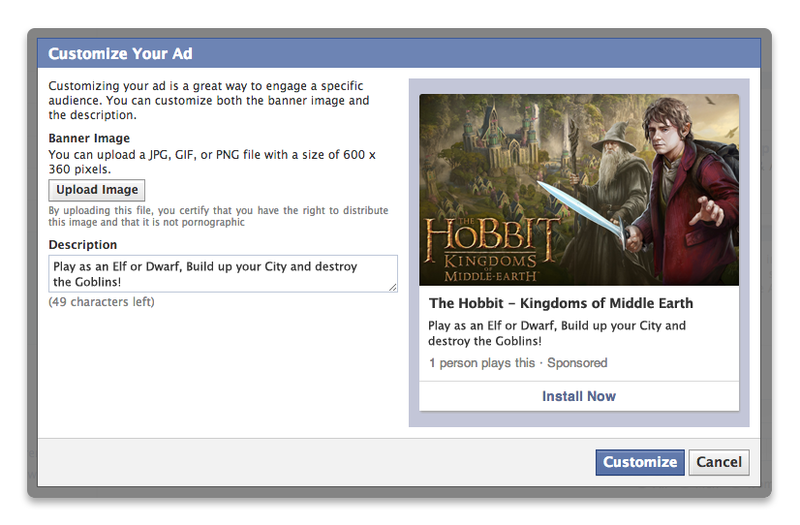 There are different types of install ads: Google Adwords Install ads, FB Install ads, Retargeting Install ads. And there is Twitter cards for app that can also help you boost your app downloads. We create engaging content module regularly in order to engage with your app users. The basic idea is, to make them interact within the app and extend its life span. We keep introducing new features every now and then to motivate the users to use the app. Social media is also there for marketing. On social web, every day comes with new opportunities. We make sure your app is integrated with all the prospective social networks. Moreover, social media opens a unique way towards brand recall. Experts believe that social signals play a pivotal role in ASO. We know that Google Play Store is different from Apple’s App Store. We optimize your app accordingly. 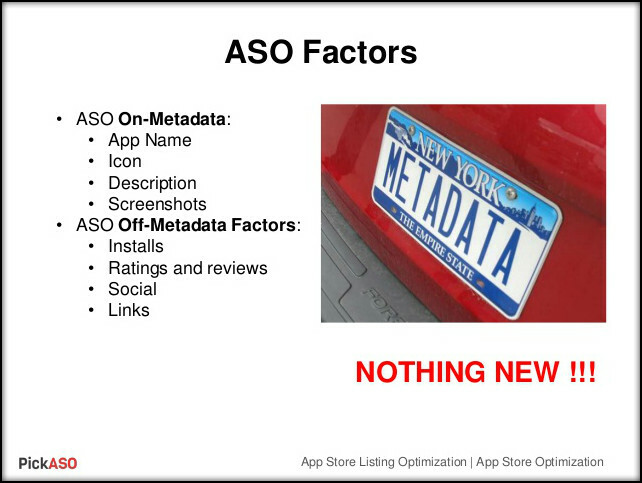 There are two major components, when it comes to app store optimization: On-metadata and Off-metadata. 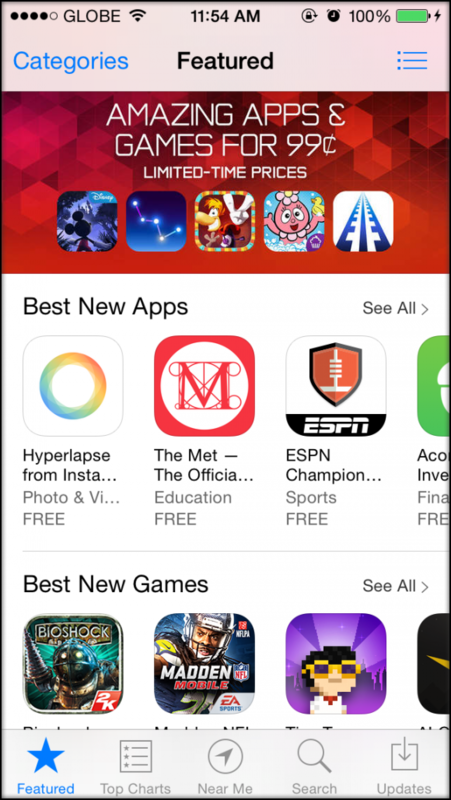 It’s important to consider the app store, for which you are optimizing an app. There is no one-size-fits-all method to do it. If you are targeting iTunes, you should give utmost priority to on-metadata. It’s because iTunes deals with various types of media like songs, movies, videos, so on-metadata factors like keyword, description, app name, publisher name are more important than off-matadata. On the contrary, if you are optimizing an app for Google Play, you must focus on algorithm and signals than anything else. For this reason, off-metadata components weigh more than on-metadata for Google Play app developers. Your app store optimizer should not only understand the differences, but also must know how to optimize one app for different app stores. Explore possibilities for your app. Fill in the no-obligation form to get a free analysis of your business. We contributed to success of 1000+ clients -ranging from one-man start-ups to MNCs. Trained hp's marketing team -TechShu, the most knowledgeable digital marketing company in India. Greenply - India's Largest Interior Infrastructure Company. Exide - A leading storage battery producing company in India. Bengal's Largest Production House, Latest Hit "Chander Pahar"
A premier organisation that represents and sets the tone for public policy for the Indian software industry. Indus Net TechShu © 2018 All rights reserved.